Hey Luv is one of my favorite tracks. When I wrote the song my heart was beaming with love. Yes I was in la la land LMAO. Hey Luv means a lot to me it was a very refreshing time in my life when I first recorded it. I took the 1997 Lauryn Hill classic from the Love Jones soundtrack “Sweetest Thing” and put a “E” twist on it. I’m so very happy that Fakeshore Drive, ChiCity Hip-Hiop, and Dude Got Bars featured this song on there sites. It means the world to me that they show me love. 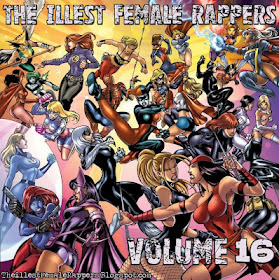 The Illest Female Rappers featured my song on there current volume 16. This will be my first compilation project and for it to be all female emcees is amazing. Right now I feel like great that people are helping me spread the world of LadyLike.